I was blessed with some crazy, allergy-ridden eyes. I can't wear contacts without my eyes throwing a fit, so I have a few pairs of glasses. I'm always on the hunt for inexpensive, but super cute frames, so I decided to branch out from my regular optics shop and try out Warby Parker's Home Try-On program. The concept is simple. Visit their site and select five different frames you'd like to try on. They ship them to you and you have five days to decide if you love any of them before you return them in the same postage-paid box they arrived in. If you can't live without a pair, just order the same pair from their website. Here are three of the five I chose. This pair is the Laurel in Peacock Green. I LOVED the color with my current red hair, but I feel like they're too round for my already round face. Maybe if the eye opening were larger, they would have worked. If you're wondering which frames look best for your face type, go with the opposite shape in the frame as the shape of your face is. My face is long, but also round, so I tend to go for more square or rectangular frames. This was probably my favorite pair of the five. This is the Ames in Whiskey Tortoise. See how the wide browline helps balance out my cheeks? 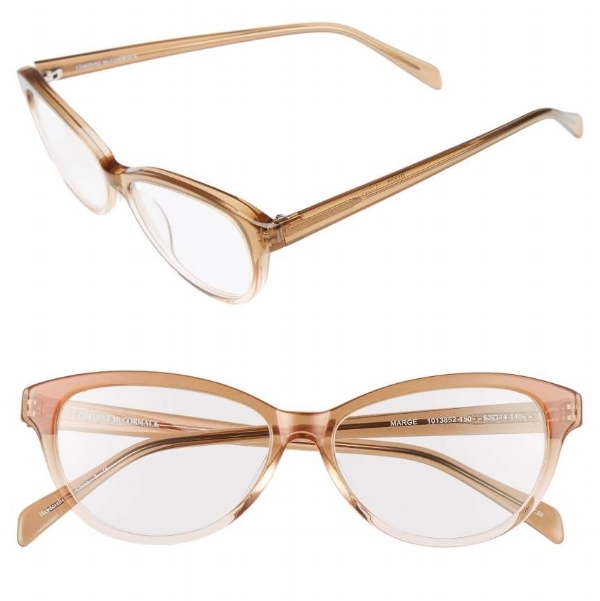 This pair is the Louise in Elderflower Crystal. The size was borderline too small, but still worked. I thought I'd try these since most of my frames are pretty bold. After seeing them on, I realize I like to draw attention to my glasses. These were just too simple. After my five days of trying on were over, I decided to stick with my favorite way of getting quality glasses inexpensively. Here's my trick. Are you ready? You can purchase whatever frames you like and take them to your optometrist. Just ask him to put your current prescription in said frames and voila! Affordable, trendy glasses. My vision insurance pays for a new pair of glasses each year, so I only have to pay for my frames. This is my current favorite pair: The Brooklyn from Bobbi Brown. They don't have this color anymore, but they do have a lot of other options. Another favorite brand of mine is Corinne McCormack. If any of you remember my leopard-print frames, they're from her! I love ordering from Nordstrom because if they arrive and you just don't like how they look on you, just send them back or return them to any Nordstrom store. Easy peasy! Also, watch for sales. Every so often, they'll have their reading glasses on sale two for $88. I wait and buy my frames then. I'm all about a bargain! Be warned, not every optometrist will do this for you. Also, they can't fit every frame. The more curved the glass would have to be, the more difficult it is to create. Basically, try to choose a more straight frame and you'll have a better chance of getting your glasses! Would you consider an alternative source for your frames?